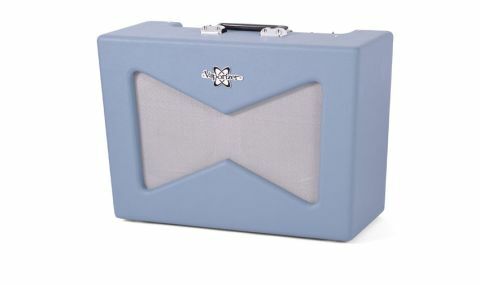 Garage rock 'n' rollers and lovers of sleazy surf sounds might just have found their new fave amp. Fun, fun, fun. Space age looks. Fantastic for surf/garage rock. Reverb is fun. Pricey, compared to previous models. No attenuator. Ahead of the release of the Vaporizer combo on test here, the cobwebbed corners of the pawn shop in Fender's head have yielded a mixed bag of curios. The series began with a range of mongrel guitar designs in 2011, before 2012's tremolo-packing Excelsior combo amp became the closest thing in the shop to an essential purchase to date, and the rate at which they were snapped up speaks volumes; you'll have to head to eBay and hope for the best if you want to corral one now. "The Vaporizer was announced at the turn of 2014, accompanied by a sci-fi promo video that reflects its Atomic Age stylings"
The Vaporizer was announced at the turn of 2014, accompanied by a sci-fi promo video that reflects its Atomic Age stylings. An initial glance at the specifications made us wonder if this might just prove to be the best Pawn Shop Special amp yet; it certainly seemed more appealing than the too-dark-sounding Ramparte and more practical for everyday use than the Excelsior, thanks to a spring-reverb tank and a pair of brash 10-inch drivers. We caught a whiff of that rare excitement that only the combination of the genuinely cool and highly affordable can generate. But wait a minute, £490 isn't that affordable, is it? It's more than the average street price for a Blues Junior, for a start, and probably more than a second-hand Hot Rod Deluxe. Happily, at press time, the Vaporizer is around £375 at most UK retailers. It's not quite as rip-their-arm-off tempting as the Excelsior's borderline crazy price tag was, but it's not half bad either. For the money, you get an amp that's about as far away from the generic black box school of backline design as is possible without paying boutique money. The dimpled Surf Green vinyl on our Vaporizer is very well applied around the angular speaker cut-out, and the big, luggage-style handle and washing machine-style dials are evocative of the US post-war manufacturing boom. Around the back, you're reminded that this is no well-preserved piece of vintage esoterica by the usual printed array of warnings and a safety grille, all in order to comply with modern legislation. On the inside, the Vaporizer is every bit the modern production-line valve amp, with most of the electronics sitting neatly on two large PCBs. There's not much here to get in the way of the sheer raucous thrill of playing rock 'n' roll guitar. Once you've matched your instrument to the appropriate input jack, your volume control then doubles up as your gain control. That said, you should never be afraid to be inappropriate; a Telecaster or Strat bridge pickup plugged into the Vaporizer's bright input is vicious, but sometimes that's what a particular part calls for. "The best sounds live just past lunchtime on the volume control in conjunction with vintage PAF-style 'buckers"
Clean headroom is, of course, partly dependent on how hard your pickups hit the Vaporizer's front end, but few would choose a 12-watt EL84 circuit for its pristine cleanliness, even if there are decent clean sounds here. The best sounds live just past lunchtime on the volume control in conjunction with vintage PAF-style 'buckers, P-90s or Filter'Trons, and bring to mind The Kinks, The White Stripes and early Zeppelin. It's not polite, but it's dynamic, responding well to an explosive picking-hand attack. Then step on the Vaporizer footswitch for loud, ragged and angry lead sounds; it's not AC30-loud, but without the ability to attenuate, it's unsubtle and untamed - there may be sound engineers in small venues who find the level unacceptable, and you certainly can't get dirt without pedals at home. The short-pan analogue spring reverb tray is suitably surfy, if a little noisy. Interestingly, the reverb output is independent, so if you turn the volume all the way down but leave the reverb up, you just hear the wet signal. It's a cool, spacey studio effect, and one we've only encountered previously on this reviewer's own, similarly retro-themed, Swart Atomic Space Tone combo. If the previous Pawn Shop Special amps have seen Fender trying to crack the quirky second- or-third amp market, the Vaporizer might just be a main gigging amp for the right sort of player. If you like your guitar sounds retro, upfront and nasty, then this is an immensely fun amp for gigs and rehearsals, as well as having a cool set of tones for studio work. Just be prepared for things to get out of control.